PA continuing its "diplomatic war" against Israel, files lawsuit over alleged "crimes of execution". The Palestinian Authority (PA) is continuing its “diplomatic war” against Israel and has submitted more complaints against the Jewish state to the International Criminal Court (ICC). 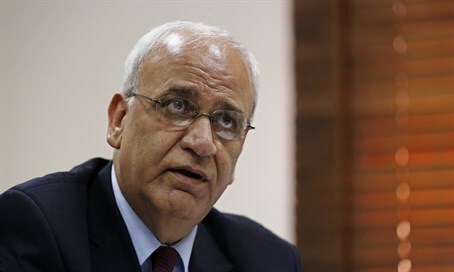 Senior Palestine Liberation Organization (PLO) official Saeb Erekat told the Hamas-affiliated Palestine newspaper on Monday that the PA a few days ago filed another lawsuit against Israel for "crimes of execution in the occupied West Bank." The PA, which joined the ICC on April 1, has in the past year filed a number of claims against Israel, including ones related to alleged Israeli "aggression" in Gaza in the summer of 2014, communities in Judea and Samaria, Israeli treatment of Palestinian security prisoners, the arson in Duma in which members of the Dawabshe family were killed, and alleged "settler terror". Two weeks ago, PA chairman Mahmoud Abbas met with the ICC’s chief prosecutor and handed to her a file documenting alleged Israeli crimes such as "ethnic cleansing". Erekat’s comments on Monday follow ones he made last week, when he declared that the PA had filed more complaints to the ICC against Prime Minister Binyamin Netanyahu and Defense Minister Moshe Ya'alon, with regards to what he called "extrajudicial executions" during the current intifada - part of the same “diplomatic offensive”. There are three ways to open an investigation into the alleged war crimes: A resolution by the UN Security Council, a formal request from the "State of Palestine" and a decision of the chief prosecutor. So far, the first two options have not been implemented, and the Palestinians are hoping the chief prosecutor, Fatou Bensouda, will decide on a comprehensive investigation based on the material received from the PA.